Definition: Coil spring wound to form a cylinder shape. Made out of round metal wire with adjacent coils which may or may not have pitch in between depending on the type of cylindrical spring. The term “cylindrical springs” automatically tells you that you’re looking for springs in the shape of a cylinder but there are different cylindrical spring types which perform different functions. Below, you are able to see the two basic types of cylindrical springs which have cylindrical bodies due to the shape of its coils. Cylindrical compression springs are helical springs with pitch in between it coils. These springs are actually designed to compress under a load and this is allowed due to the space in between the coils. The type of metal used and the heat treatment they receive at the time of their manufacturing allows the cylindrical compression spring to have memory within its coils so that when the load is lifted or the spring is released, the coils will push back to their original position known as the free length. 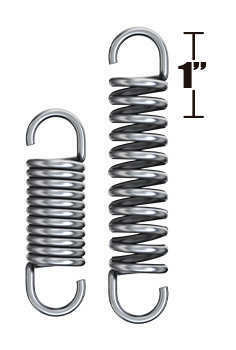 Compression springs have a constant spring rate which tells you how much load it’ll take your spring to compress 1 inch. This value will depend on your spring’s dimensions and material type so you may refer to our force chart at the bottom of this article to learn how to make your spring stronger or weaker. 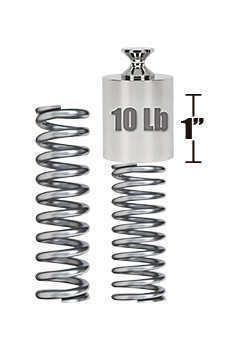 You have a cylindrical compression spring with spring rate of 10 pounds of force per inch of travel. This means that for 1.5 inches of travel, it’ll take 15 pounds of force and for 2 inches it’ll take 20 because you multiply the travel by the spring rate. Cylindrical extension springs are coil springs with adjacent coils that don’t have any space in between them. Extension springs have tension already gathered in between their coils so that they remain together. They are used to be extended by a force and to return back to their original or pre-loaded length once the load is removed. 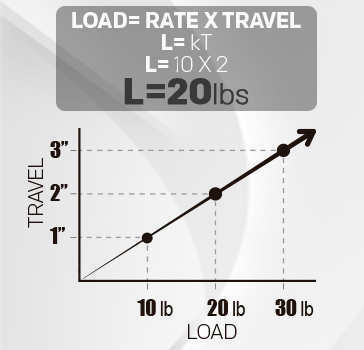 Due to their initial tension, though you will have two values of load to calculate the exact load it’ll take you to travel to a certain extended length. First off, to release this initial tension, you must extend the spring just enough so that you’re able to see some light in between the coils. Whatever force it takes you, you must add that to the calculated load using the travel and rate formula. You have a cylindrical extension spring with an initial tension of 1 pound and a spring rate of 5 pounds per inch. To make your spring travel 0.5 inches, you must multiply this value by the spring rate and then add the initial tension. This means that it’ll take 3.5 pounds to extend your spring 0.5”. When designing your spring you are also trying to meet certain working loads. When it comes to compression springs, for more force, you can decrease the outer diameter, increase the wire diameter, reduce the amount of coils, or increase the free length to get more force through more travel. To get less force out of the spring, you do the exact opposite. Increasing or decreasing the free length isn’t always an applicable option but if your spring has the room, it is definitely a helpful resource. For extension springs you must follow the same process except that in this case, to change the number of coils, you must adjust either the body length or the hook length. Shortening the length inside hooks to increase force through more travel isn’t very recommended but if you have the room and have no more options, go for it. You can always use our free online spring calculator to perfect your design and even get a custom spring instant quote.